We called the company Claim Your Space for a reason—because position matters. Like my post picture up above here. An airplane in the sky, up above the water line—totally normal. The same airplane below the water—not so good. The SEO guys have preached it for years. It’s no less important in paid search. Top of page positions regularly enjoy +25% click-through-rates. Towards the bottom of the first page, you can expect less than 1%. That’s a 25x range in performance! And this really makes Google Ads bidding a sink-or-swim proposition—especially since we lost those sweet sidebar ads. Remember these? You’re either up top, in the first through 3rd, or maybe 4th position. Or you’re down at the bottom, below the organic listings—down in <1% CTR territory. As paid search marketers we’re in a constant balancing act with bidding. Bidding enough to stay on top, but not overbidding to maintain the highest possible ROI. We use all sorts of strategies to achieve that end. Bid automation is a big topic. And we’ve watched an explosion of options within Google Ads over the last two years. 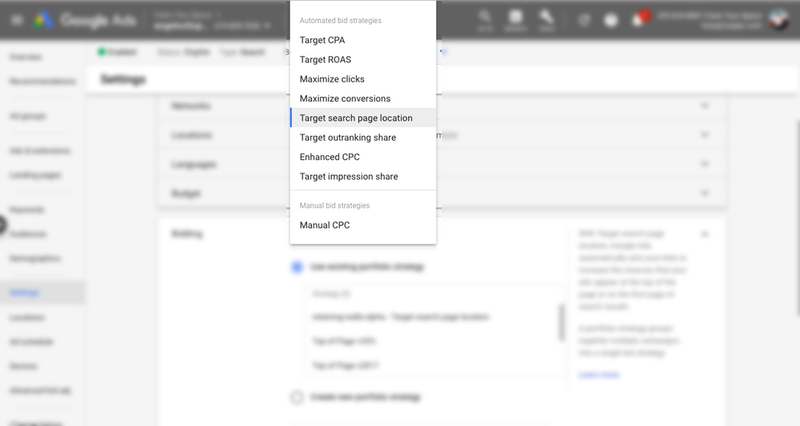 We’re up to 10 available bidding strategies in Google Ads (including adding ‘Enhanced CPC’ to manual bidding). 10 different bidding strategy—which to choose? Adding complexity to that equation—new competitors can enter the auction at any time and really change the landscape. It happens more often than I wish it would. 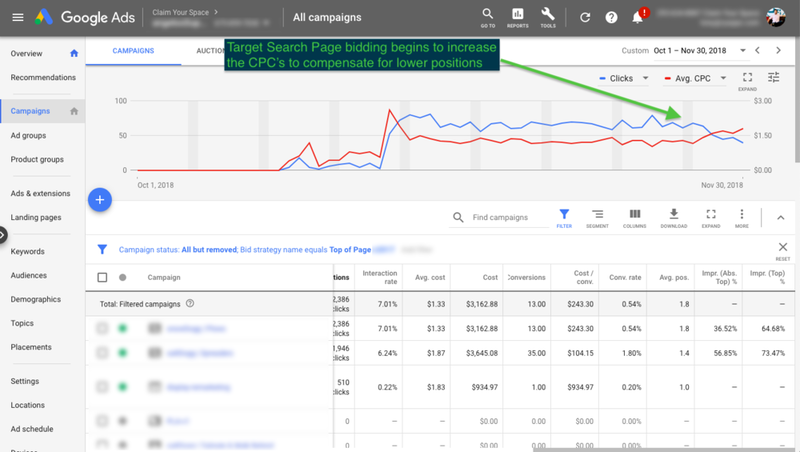 Don’t get me started on the fact that since the launch of the new user interface earlier this year, all new search campaigns created in Google Ads default to a “Max Clicks” bidding strategy. Our tests have shown this could just as well be named “for-sure-pay-the-highest-cpc-possible”. This scenario is exactly what happens to us every year for a client that advertises seasonal products—think snow removal. Various new competitors enter the marketplace at different times during the season. There are tons of sales from November through February. And the rest of the year doesn’t really matter. So if we lose top-of-page position during that key sales window—we stand to lose 96% of the available traffic! If we lose top-of-page position during that key sales window—we stand to lose 96% of the available traffic! Well not exactly. We still have a rising CPC to content with. Which will for sure affect profitability. But falling off the top results or even worse to the 2nd page would do much more damage than putting a dent in profitability. These guys are used to getting 100+ orders per day from their store during the busy season. If they only end up getting 5 orders because their ads drop off, there are no happy campers!